Robometricschool. - One of advanced innovation technology that presented in CES 2013 is from television technology. In technology exhibition Consumer Electronic Show CES 2013 in Las Vagas United Stated, LG industry present advanced innovation technology from television using Organic Light Emitting Diode OLED. OLED TV is advanced television technology that not use rear lamp lighting circuit as the picture show. So it is very different with flat television that use rear lamp lighting circuit as picture show. In OLED TV rear lamp lighting circuit changed with each LED is embedded in it is able to produce their own organic lighting. In CES 2013, LG introducing OLED TV with series EA9800 as curved-screen TV with a wake that is claimed as the world's first technological revolution. EA9800 shape curved screen 3D feature. can make the user's eyes have the same relative distance to reach every image on the screen showed. Having more slim shape. It is because no rear lighting in OLED TV EA9800 series. improve the ability to produce detailed images in dramatic colors and lower power consumption. Using technology 4-Color Pixels WRGB (White, Red, Green, and Blue). In here OLED add White color composition that make increasing the brightness of the color impressions. 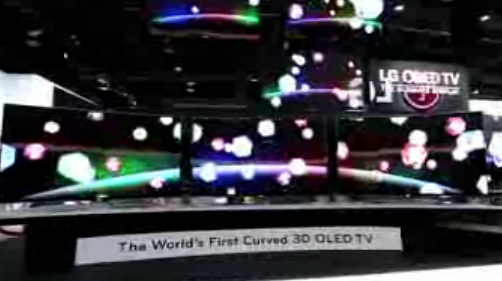 LG uses material Carbon Fiber-Reinforced Plastic (CFRP) and make OLED TV EA9800 series has a lighter weight.